On the bench: 7.7GB/s with 3 Samsung 950 Pro in Raid0 – the edit bench. The day I decided to buy another Samsung 950 Pro 512GB, I already dreamed of running both at blazing speeds in Raid0. Unfortunately, the quest was a bit more complicated than I anticipated. Before made the switch of my media volume to two 950 Pros, I ran two Samsung 850 Evo 1TB in Raido. So I thought that I could simply do the same with my two 950 Pros, but until today, I haven’t managed to make Intel Rapid Storage Technology recognize the two nvme drives. I almost gave up on the idea of running them in Raid0, when I remembered that you could also create striped volumes using the Windows disk management tool. I was sure it was going to work out badly, but I still tried it. To my surprise, results weren’t as bad as I thought. Acutally, the created volume was blazing fast! Yes – these results are correct. I actually run the same test several time because I couldn’t believe it myself. It takes until a transfer size of 512kb-1mb for the Raid0 to take off at full speed. Interestingly, the Samsung driver took a bit longer to reach that point. Compared to the single drive, we get basically double the speed as it should be with Raid0. Similar to the results at QD4, but at QD10, there was a small performance drop at 128 and 256kb. You read correctly – the Microsoft driver performed better overall, while the Samsung driver won the 4k reads. Access time was significantly better with the Microsoft driver. Here, the Raid0 performance wasn’t twice as fast. Sequential reads/writes were substantially faster with the Raid, while 4K reads of the single drive actually outperformed both drivers in Raid0. In CrystalDiskMark5.1.2 results were mixed. Overall, the two were really close. The Samsung driver performed maybe a little better here than the Microsoft one. 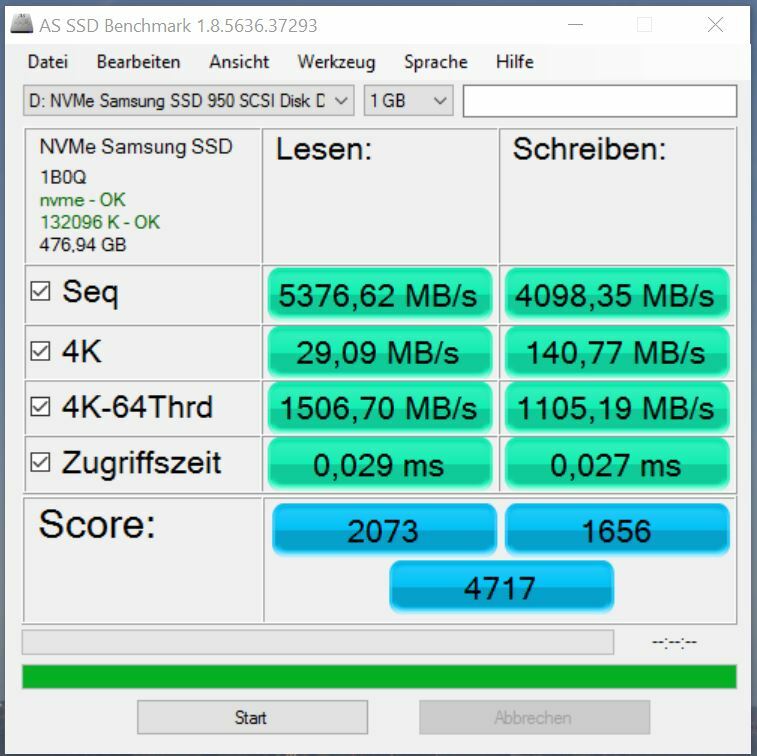 As with AS SSD, 4K reads were higher with the single drive. WOW! Transfer rates reached up to 7750MB/sec! The two drivers are much closer now. The Microsoft driver performing a tiny bit better up to a transfer size of 64kb. This Raid0 configuration is almost 3 times faster than a single drive. At QD the picture from the 2-drive setup repeads itself. Both drivers perform very similar. At 256kb and 512kb performace drops. While the Microsoft driver picks up speed again at 1mb, the Samsung driver needs a little more time until 2mb. In this case, Samsung wins with a top score of 4741. The Microsoft driver performed a bit better on reads though. Again, results are not clearly showing a winner. both drivers perform well. In some areas, the Microsoft driver wins, in othesr the Samsung driver. I was positively surprised to see that the preinstalled Microsoft disk manager and nvme driver perform very well in the benchmarks. It seems that Samsung still needs to fine-tune its driver to deliver superior performs in all areas. The requential speeds are just phenomenal when two or three 950 Pros are combined in a Raid0 volume. I have no prior experience to using the preinstalled disk management tool so I have no idea how stable it will perform. I will definitely keep two 950 Pros in a Raid0 for my media and one single drive for scratch disk and see how reliable they are when put to everyday use. 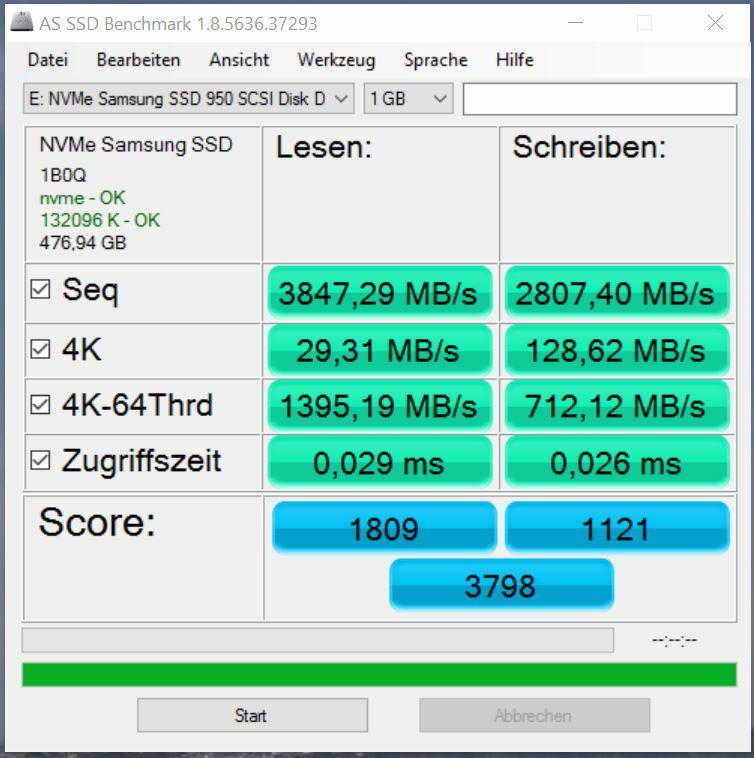 How could you test the Samsung NVME driver for the 950 pro when it will not support or see the driver in raid 0 ? It didn’t work in Intel Rapid Storage, but with the simple Windows striping tool. There, I could create striped volumes with both drivers. I checked drivers with Magician. Yes, however in your configuration, you cannot use the raid 0 drive as a boot drive with your OS installed on it. That is true. My OS is on a 850 Pro SSD. The test is more about what is possible with several 950 Pros. For me, having fast media and cache drive s is most important. I ran a couple of tests with the OS on one 950 Pro drive, but boot and program start up times were not noticeably better. Next Post Overclocking – how does it affect export times?